RTÉ cameras at Páirc Uí Chaoimh. There's a huge few days of GAA coverage ahead with a total of ten games being shown live between football, hurling and ladies football. Saturday sees the opening two games of the new All-Ireland senior football championship Super 8s down for decision at Croke Park. Tyrone V Roscommon is being aired by Sky Sports while RTE are showing the big meeting of Dublin V Donegal. 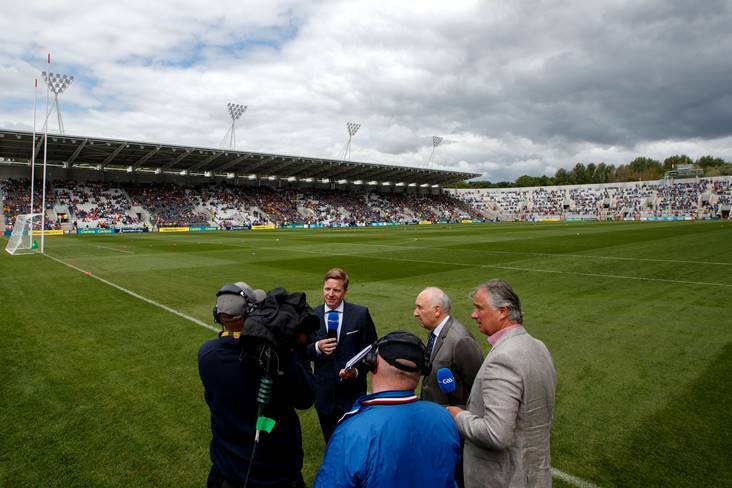 Tomorrow's RTE coverage will start at Pairc Ui Chaoimh for the All-Ireland SHC quarter-final clash of Clare and Wexford. Meanwhile, TG4 have live coverage from the All-Ireland U20FC semi-final between Kerry and Kildare, as well as two games from the All-Ireland Ladies senior championships beforehand. The Irish language station also offer live coverage from the other All-Ireland U20FC semi-final (Derry V Mayo) on their Youtube channel: https://www.youtube.com/watch?v=0PNLVSpPvHk. It's back to GAA headquarters on Sunday for Kildare V Monaghan (Sky Sports) and Kerry V Galway from Group 1 of the Super 8s. RTE's coverage of Kerry V Galway will be preceded by the intriguing All-Ireland SHC quarter-final between Kilkenny and Limerick in Thurles.